Like migratory birds, most of Canada's 20,000 'guest' farm workers arrive in the spring and leave in the autumn. Hailing primarily from Mexico, Jamaica, and smaller countries of the Caribbean, these temporary workers have become entrenched in the Canadian labour force and are the mainstay of many traditional family farms in Canada. Many of them make the trip year after year after year. Vincenzo Pietropaolo has been photographing guest workers and recording their stories since 1984 - in the process travelling to forty locations throughout Ontario and to their homes in Mexico, Jamaica, and Montserrat. The resulting photographs have been highly acclaimed internationally through many publications and exhibitions, including a travelling show curated by the Canadian Museum of Contemporary Photography that opened in Mexico City. With a foreword by Naomi Rosenblum, this beautiful and timely book of photography and exposition aims to shed light on a subject about which many Canadians know all too little. ?The tomatoes are local, all right?but we?ve flown whole villages of Mexicans here to pick them for us, for low pay and in bleak conditions. Those labourers look out of Pietropaolo's honest black and white photographs, their hands full of fruit, as though posing us a question. Is this the right way?" "In the supermarket, everything looks poster-perfect. But Vince's camera opens our eyes to the bruises, skill, and humanity too often left out of the picture. As we strive for food that is more honest, real, local, healthy, and responsible, this fresh look at our food system shows us an important place where the fruits of labour need to be properly shared." "Vincenzo Pietropaolo's genius in these photographs is to suggest whole histories and whole worlds in the simplest of images. He takes a phenomenon most of us are hardly aware of and makes us see in it the story of a continent." "Vincenzo Pietropaolo's photographs have the intensity found in Jean Mohr's and John Berger's seminal book, "A Seventh Man." Pietropaolo's engagement with the dignity and forebearance the workers show in their seasonal exile allows us to return, through these very fine photographs, to early notions of the honesty of documentary work." ?Meeka Walsh, editor, "Border Crossings"
"Pietropaolo's portraits of migrant farm workers and their lives shows them the very respect he says they deserve for the service they give us: they grow our food and without them we couldn't do it." 'The tomatoes are local, all right-but we've flown whole villages of Mexicans here to pick them for us, for low pay and in bleak conditions. Those labourers look out of Pietropaolo's honest black and white photographs, their hands full of fruit, as though posing us a question. Is this the right way?" -Meeka Walsh, editor, "Border Crossings"
"Vince's photos suggest that the old phrase If you ate well today, thank a farmer, ' should read, thank a guest worker'-or a seasonal worker, impermanent resident, or permanently temporary immigrant. Whatever the descriptive term, these men and women are the backbone of today's farming industry in Canada." ""Harvest Pilgrims," the product of over 20 years' work, places photographer Vincenzo Pietropaolo firmly in the ranks of such chroniclers of the uprooted and marginalized as Dorothea Lange and Walker Evans." 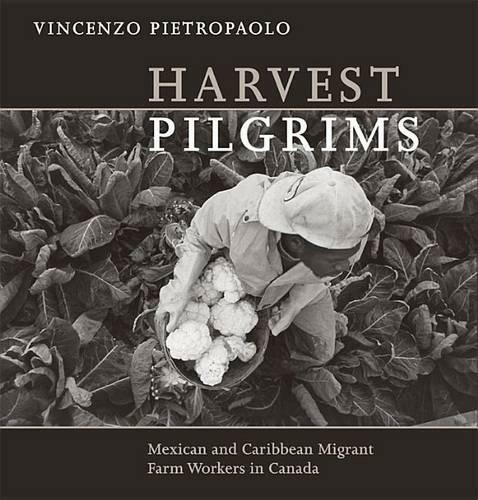 "Visibility is the only catalyst by which public awareness is heightened, and the struggle of the migrant workers represented in "Harvest Pilgrims" promises to increase Canadians' awareness of this segment of the working population."